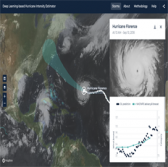 NASA uses an Amazon Web Services tool with a machine learning infrastructure designed to help agency personnel monitor and calculate the wind speed of hurricanes. The Deep Learning-Based Hurricane Intensity Estimator works to generate and display wind flow velocity at 15-minute intervals with the use of near real-time images from GOES-16 satellite’s web mapping server, according to an AWS blog article published Friday. NASA’s Marshall Space Flight Center and the Development Seed organization jointly developed the HIE platform. The system is designed to leverage the AWS CloudFormation service and the agency’s cloud-based Cumulus framework that supports Earth observation data collection, storage, distribution and management functions. “Cumulus software infrastructure and the cloud platform open up new opportunities for researchers, developers, and the general public,” said Kevin Murphy, program executive for Earth science data systems at NASA.